Image: Can be found here, under a CC license. SCP-3013, prior to Experiment 3013-8. Special Containment Procedures: Following the events of Experiment 3013-8, SCP-3013 is currently located in what was Secure Holding Facility B of Site-██. This room has been surrounded by a hermetically sealed container. On no account are any structural changes to be made to this holding facility or container, unless to reinforce the former Secure Holding Facility B. Surveillance cameras and guards are posted at intervals around this chamber. One entrance leads directly to SCP-3013’s holding chamber; this is not to be used unless some way is found to penetrate the SCP-3013-1 instance currently permeating the holding chamber. SCP-3013 is currently located in Secure Holding Facility B in Site-██. SCP-3013 is to be fitted with a painting on canvas or paper at all times. 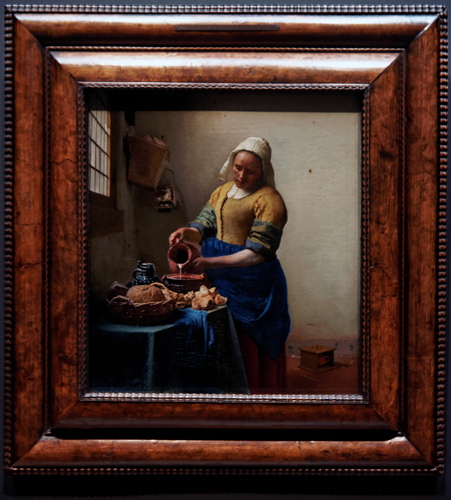 The painting currently used is a copy of Johannes Vermeer’s "The Milkmaid", although due to the eventually violent nature of the SCP-3013-1 instances which are created as a result of these procedures, the search for an alternate painting is ongoing. The SCP-3013-1 instances created as a result of these procedures are to be given a variety of tasks which approximate duties which a female Dutch servant would have performed in the mid-17th century. Armed guards are to be present at all times to prevent violent outbursts which might damage SCP-3013. Due to the inevitability of a violent outburst occurring after 14 hours, it is recommended that the current SCP-3013-1 instance be terminated every 12 hours. Description: SCP-3013 is a wooden picture frame, which will alter its size, shape and style to accommodate any painted canvas or paper inserted into it. Once a painting is inserted into it, SCP-3013-1 instances will begin to manifest in the surrounding area. SCP-3013-1 instances are usually objects, people or alterations to the landscape which resemble features of the painting inserted into SCP-3013. The nature of these SCP-3013-1 instances changes depending on the painting in question. In a portrait-painting, or a picture dominated by human or animal figures, SCP-3013-1 instance will usually resemble the human or animal figures present in the painting. Such SCP-3013-1 instances will ordinarily be sapient, and will possess personality traits related to the subjects of the painting or the nature of their composition. If a painting with a lesser focus on human or animal figures is placed in SCP-3013, such as a landscape painting or an abstract piece, then SCP-3013-1 instances will often instead be an alteration of the physical environment around SCP-3013. Further details can be found in the experiment log below. Should SCP-3013 not have a painting within it, then an SCP-3013-2 event will occur. This consists of gradual damage affecting the landscape surrounding SCP-3013, usually via noticeable subsidence in the surrounding area, in addition to cracks and fault lines appearing over the course of several hours in the landscape and any structures close to SCP-3013. Although SCP-3013 is not indestructible, attempts to harm it simply result in extremely fast-acting and intense SCP-3013-2 events. SCP-3013 was first discovered by the Foundation in 20██, in the ruins of ██████████ Hall, a country manor in Norfolk, England. It is believed that a recent burglary had seen the painting currently in SCP-3013 removed, prompting the activation of an SCP-3013-2 event, resulting in the destruction of ██████████ Hall and several earthquakes registering above 8 on the Richter Scale. ██████████ Hall had been abandoned since 197█, when its previous occupant, Annabel Stone, had died. Mrs. Stone had been a prominent local artist, but had reportedly become a social recluse several months after her husband’s death in 193█, and had rarely ventured out of her home thereafter. The house was considered to be haunted by the local inhabitants after her death, with attempts to enter the property ordinarily resulting in considerable emotional distress to the intruders. Due to the events of Experiment 3013-8, SCP-3013 is currently unreachable, due to an SCP-3013-1 instance permeating its current containment chamber. It is currently believed that should the current containment procedures limiting the present SCP-3013-1 instance to its current parameters be destroyed, an XK-class end-of-the-world scenario could be possible. As the present SCP-3013-1 instance appears to be limited by the boundaries of the room it was contained in, despite a lack of clear physical impediments. It is thus believed that SCP-3013’s effects are currently tied to the conceptual space of the room rather than any physical barriers. Subject: A copy of Rembrandt van Rijn’s “Self Portrait with Beret and Turned-Up Collar”, originally dated to 1659. This picture was considered a viable candidate for containment, as the depiction is relatively straightforward and lacks any complicating elements. Effect Observed: An SCP-3013-1 instance, resembling the figure portrayed in the painting, manifested a few feet away from SCP-3013. The figure began speaking in a dialect of 17th century Dutch, speaking about how it “existed twice”, and that his presence was a “destruction of the self”. After several minutes, the figure became violent, attacking the facility’s guards and demanding that he “was made whole again”. The SCP-3013-1 instance was immediately terminated, and the picture in SCP-3013 removed and replaced. Notes: It is believed that the reaction of the SCP-3013-1 instance was due to the use of a self-portrait. It is recommended that self-portraits should not be used again, due to the distress caused to the SCP-3013-1 instance here. Subject: A copy of Johannes Vermeer’s “The Milkmaid”. This picture was considered a viable candidate, in the belief that the woman portrayed would not be violent and would pose little threat to any Foundation personnel. Effect Observed: An SCP-3013-1 instance, resembling the figure portrayed in the painting, manifested a few feet away from SCP-3013. The figure began speaking in a dialect of 17th century Dutch, requesting a task to perform. When Foundation personnel were unable to provide it with a suitable task, the SCP-3013-1 instance exhibited extreme emotional distress for several minutes, begging to be given a task before attempting to attack SCP-3013. The SCP-3013-1 instance was immediately terminated and the painting removed. Notes: Subsequent tests were performed using this painting. In these, SCP-3013-1 instances have been given tasks do superficially resembling the duties of a 17th century Dutch servant to a middle-class household. The instances perform these tasks constantly, despite physical and emotional fatigue, and become distressed if no task is given to perform. Possibly due to the fatigue, the instances will always become violent after approximately 14 hours, at which point they are terminated. Another instance will manifest shortly afterwards. These SCP-3013-1 instances are usually non-verbal, expressing little co-operation with Foundation questioning; however, when asked on one occasion why they feel the need to perform these tasks, an SCP-3013-1 instance responded, stating that “I’ve been serving on paper for far longer than I ever did in life. It’s all I know”. Due to the relatively low resource cost of this test, it is been incorporated into the containment procedures for SCP-3013 until a suitable replacement is found. Subject: A copy of the 16th century Persian miniature “The Court of Gayumars”, drawn by the Safavid miniaturist Sultan Muhammad. This picture was initially part of the famous “Tahmasp Shahname”. This painting was used to examine the effects of a radically different style of painting, wherein the painting was conceived of as an extension of textual decoration rather than as an independent work. Effect Observed: An SCP-3013-1 manifestations resembling the painting’s depiction of Gayumars immediately manifested, screaming the phrase “Where are my brothers?” over and over again at a high volume. After 30 seconds, several SCP-3013-1 manifestations resembling the animals in the painting manifested and immediately began to attack Foundation personnel. The painting was swiftly removed, causing the instances to disappear. Notes: It is believed that, as the page was originally designed to illustrate a volume alongside many other pictures, its existence as a painting removed from context caused a high degree of panic and stress in the SCP-3013-1 instances. It is recommended that all future paintings used are to be independent works of art, with a meaning that is not dependent on its position within a larger whole. Subject: A drawing of the Project Lead, Dr. F██████ and her husband Dr. R█████, created by their young child I███████ R█████. The child had attempted to draw an accurate representation of its parents, but had deemed its drawing a failure. This experiment was performed to ascertain the effects on SCP-3013 wherein the intended result was not achieved. Effect Observed: Two SCP-3013-1 instances resembling the figures in the drawing manifested. These instances were observed to constantly sob and scream, begging to be killed because of their “failure”. Shortly afterwards, they attempted to attack SCP-3013, stating that they “needed to be unreal again.” The instances were swiftly terminated and the painting removed from SCP-3013-1. Notes: By order of Dr. F██████, no drawings by children are to be used with SCP-3013 again. Subject: A copy of the painting “View of Haarlem with Bleaching Fields” by the 17th century Dutch painter Jacob van Ruisdael. This experiment was conducted to ascertain the effects a landscape painting would have on SCP-3013. Effect Observed: SCP-3013-1 instances resembling grass and trees rapidly began growing from the floor of the containment facility, and attempted to restrain and strangle Foundation personnel present. SCP-3013 was swiftly removed, causing the disappearance of the SCP-3013-1 instances. Foundation personnel present have insisted that they could hear the words “You do not belong here” and “you are not Arcadian” being whispered to them, but audio logs reveal no such sounds. Notes: This highly unexpected result, which lacks a clear explanation, has prompted further testing of landscape paintings with SCP-3013, especially those drawn in a non-European tradition. Subject: A copy of the painting “Pine Trees” by the 16th century Japanese artist Hasegawa Tohaku. After the results of Experiment SCP-3013-5, a desire to examine further landscape paintings is ongoing. Effect Observed: The containment facility containing SCP-3013 abruptly disappeared, along with all of its contents. Video and audio links were abruptly cut. After 893 minutes, the containment facility and its contents abruptly returned. All Foundation personnel were unharmed but extremely shaken. They claim that the containment facility and its contents were transported to hilly landscape stretching indefinitely in all directions, with pine trees being the only other features in the landscape. Immediate amnesia, alongside an extreme feeling of panic, prevented them from removing the painting for several hours, until Agent R██, in a fit of panic, accidentally ripped the painting in two while “flailing in a mad panic”, causing the reversal of the effects of SCP-3013. Notes: By order of Dr. ██████, experimentation with landscape paintings and SCP-3013 is suspended until further notice. Subject: A copy of Georges Bracques’ “Violin and Candlestick”. This was to determine the effects of a manifestly non-realist style, in this case Cubism, on SCP-3013. Effect Observed: The containment facility and its contents began to exhibit severe physical anomalies, with the abrupt deconstruction of several objects and the walls. The painting was swiftly removed from SCP-3013. A total of 8 Foundation personnel expired as a result of this experiment. Notes: Following this experiment, Dr. F██████ was removed as project lead, and replaced by Dr. ████. It was believed that due to Dr. ████’s capable and straightforward handling of the termination of SCPs ████, ███ and ████ he would provide a more mainstream and rational testing approach. Subject: A copy of Mark Rothko’s “Untitled (Black on Grey)”. It was believed by Dr. ████ that this would have a negating effect on SCP-3013’s anomalous properties, owing to the artist’s statement that the painting’s meaning was concerned with death. Effect Observed: The containment facility was abruptly filled with an SCP-3013-1 instance. This instance appears to be an absence of all matter. The instance is incapable of absorbing or reflecting light, with observers ordinarily providing no other descriptor than "darkness", although some respond by calling it "death" instead. The status of all objects and people within the holding facility at the time of this SCP-3013-1 instance's manifestation- including SCP-3013 and 12 Foundation personnel- is presently unknown. Attempts to penetrate this instance by objects and personnel have simply resulted in them being sucked into the instance. Notes: Due to the unexpected results of this experiment, SCP-3013 is currently unreachable. The containment procedures have been updated accordingly. The current SCP-3013 instance appears to possess some form of anti-memetic effect; it is believed that a total of ██ Foundation personnel were sent into the current SCP-3013-1 instance to retrieve SCP-3013, before an investigation by [REDACTED] determined that Foundation personnel were systematically forgetting the existence of any personnel being sent into the containment facility. It was delightful to see you last week! The children are growing up so fast now; I could hardly recognise them. I must thank you for your recipe for those jam tartlets- I might cook them for the church fundraiser next month. Your new house is so lovely- that little London flat of Jack’s always seemed to be far too dark and squalid for you. I do appreciate your attempts to lift my spirits after Elijah’s passing, but there really is no need. It has been almost a year now, and I am doing quite fine on my own. My paintings are selling well recently, and a fellow from London recently bought that picture of my niece Harry for a tidy little sum. I do miss him dreadfully, but I’m beginning to piece things back together again. Reverend Jacobs has been most helpful, and always provides a kind shoulder to lean on. I think he might be a little sweet on me- he is an awfully handsome fellow, and it doesn’t do for someone in his line of work to be unmarried at his age. By the way, I know that you’re interested in spiritualists and mediums, so I thought this little story might amuse you. There’s a medium in the village, who I think I’ve mentioned before- “Madam Quentin”, she calls herself. I think it’s all frightful nonsense, personally, but it does provide me with some amusement in the evenings- watching all the locals get in a tizzy over some great-aunt they never cared about any way is rather fun. Anyway, there was a chap from America there, a doctor of some kind, who knew Elijah! Said that he knew him from his work in London- they’d often met up at the Belgrade, apparently. He gave me the most marvellous wooden frame- it's in a delightful shade, and with a lovely pattern carved into it. And I must tell you, Maud- he seemed at first like a perfectly charming and amiable young gentleman, but once he had given me the frame, he leaned in and said the strangest things. And then, he quite abruptly left, before I was able to ask him what on earth he meant! It was all very mysterious, and the whole thing left me feeling a little shaken. I’m not sure that he was quite right in the head. But the frame is such a lovely piece of craftsmanship, all the same. I think it’s the perfect fit for that picture I painted of him a month before his passing. At this point, there is a break of several lines, before the text resumes. The hand appears to be the same, but with a far shakier grasp on the pen, believed to be due to advanced age. It is believed that this portion of the letter was written several decades after the first. I don’t remember this letter. I must have just forgotten about it, what with all the excitement of the day. I should have finished it, I suppose. I was rude not to. But I can’t pretend I really care. You’re long dead now, Maud. I don’t think I ever saw you again after this. I couldn’t see the point. I didn’t have to try any more. I didn’t have to be brave, I didn’t have to pretend to be happy, I didn’t have to be lonely in a crowd any more. I didn’t have to try. It’s just me, and him, and he never grew old and he always loves me.